EVERYTHING’S IRISH ON ST. PATTY’S DAY, EXCEPT THE CORNED BEEF! St. Patty’s Day is this Sunday, so supermarkets are full of packages of processed corned beef in preparation for the big celebration. Too bad corned beef isn’t an authentic Irish dish! The phrase “corned beef” was actually coined by the British, and although the Irish were known for their corned beef throughout Europe in the 17th century, beef was far too expensive for the Irish themselves to eat and all of it was exported to other countries. Owning a cow in Ireland was a sign of wealth, and the Irish used theirs for dairy products, not beef. The Irish ate pork, and a lot of it, because it was cheap to raise pigs, and they traditionally prepared something like Canadian bacon to celebrate St. Patrick’s Day in Ireland. In the 1900’s, when the Irish came to America, both beef and salt were more affordable, and the Irish, who lived in poor, tight-knit communities, often next to Jewish communities, bought much of their beef from Kosher butchers. And so many of the Irish learned how to corn their beef using Jewish techniques, but adding cabbage and potatoes to the mix. It takes about 3 weeks to make corned beef. But now that you know it’s not Irish anyway, that’s OK! (If you’re dying to have it on St Patty’s Day anyway, just buy yourself a supermarket slab this time, then make your own when the craving hits again.) Doing it yourself is not difficult. It just takes time…and you get a really delicious slab of beef. 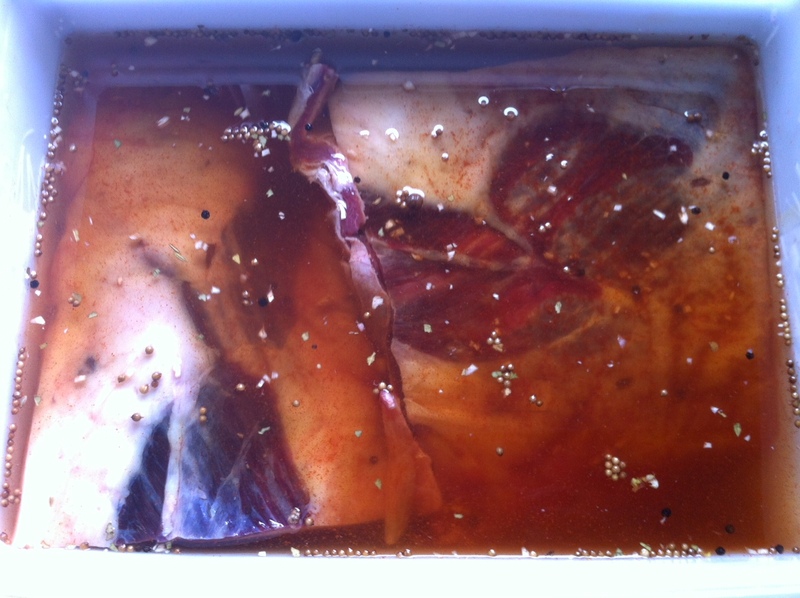 Brining is a time-honored way of preserving meat and it prevents bacteria from growing. Both pastrami and corned beef are made by this method. Both start with a brisket of beef. Corned beef is then cooked–usually boiled–and served. 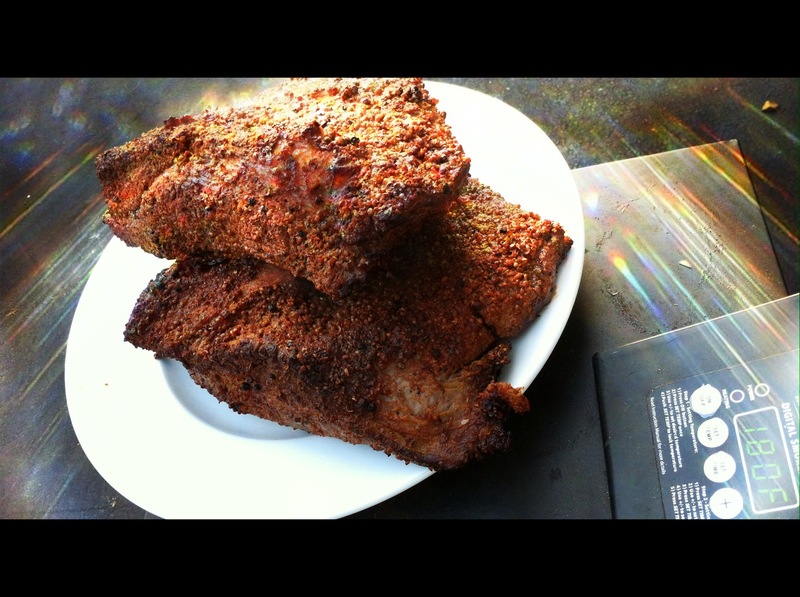 Pastrami is made when the brined meat is rubbed with more spices and then smoked to add extra flavor. So corned beef and pastrami are the same meat, just treated differently. Saltpeter is an ingredient that has been used in brining beef for years. It adds the traditional red coloring to the corned beef and pastrami meat. But since saltpeter can also contain carcinogens, I leave it out. The meat may not be the usual bright red color, but the flavor and texture of the meat will not be affected. Place the brisket in a large container made of non-reactive material, like glass or plastic. In the 1/4 cup of warm water, dissolve the sugar, minced cloves, paprika and pickling spices. Dissolve the 3/4 cup of salt in the 2 quarts of water. Pour in the sugar/garlic/paprika/pickling spices mix and stir everything together. Pour the mixture over the meat in the container. Make sure the meat is totally beneath the surface of the liquid. (You may need to weigh it down to do this.) Cover the container. Refrigerate the container and its contents for 3 weeks, turning the meat once or twice per week. At the end of the third week, remove the container from the refrigerator and take out the meat. Soak the meat in several changes of fresh cold water over a period of 24 hours to remove the excess salt. At this point, if you want corned beef, prepare and cook it using your favorite recipe. But I’m all about the pastrami! Combine the coriander seeds, black and white peppercorns and mustard seeds in a spice grinder and grind coarsely. Place in a bowl. Add the salt, paprika, brown sugar and granulated garlic. Mix well. Rub the mix into the brisket well, covering all sides. Heat your smoker to 225 degrees and smoke for several hours using a less intense wood, like oak. When the internal temperature of the meat has reached 165 degrees, it’s done. It isn’t necessary to smoke pastrami as long as you would a regular brisket because the long brining time makes the meat tender. It is very important that absolutely everything that comes in contact with the meat is very clean. (This includes your hands.) Also, make very sure that every inch of the meat reaches the 165 degrees before it is removed from the smoker. The corned beef is now pastrami. Despite that corned beef is not an authentic Irish dish, it seems that everyone thinks they should eat it on St. Patrick’s Day. The phrase “corned beef” was actually coined by the British, and although the Irish were known for their corned beef throughout Europe in the 17th century, beef was far too expensive for the Irish themselves to eat and all of it was exported to other countries. Owning a cow in Ireland was a sign of wealth, and the Irish used theirs for dairy products, not beef. In the 1900’s, when the Irish came to America, both beef and salt were more affordable, and the Irish, who lived in poor, tight-knit communities, often next to Jewish communities, bought much of their beef from Kosher butchers. And so many of the Irish learned how to corn their beef using Jewish techniques, but added cabbage and potatoes to the mix. It takes about 3 weeks to make corned beef. But now that you know it’s not Irish anyway, that’s OK! (If you’re dying to have it on St Patty’s Day anyway, just buy yourself a supermarket slab this time, then make your own when the craving hits again.) Doing it yourself is not difficult. It just takes time…and you get a better final product. Brining is a time-honored way of preserving and it prevents bacteria from growing. Both pastrami and corned beef are made by this method. Both start with a brisket of beef. Corned beef is then cooked–usually boiled–and served. Pastrami is made when the brined meat is rubbed with more spices and smoked to add extra flavor. So corned beef and pastrami are the same meat, just treated differently. It takes about 3 weeks to make corned beef. But now that you know it’s not Irish anyway, that’s OK! Doing it yourself is not difficult, and you get a better quality product than that nasty slab from the supermarket that’s full of chemicals and preservatives. Refrigerate the container and contents for 3 weeks, turning the meat once or twice per week. At the end of the third week, remove the container from the refrigerator and take out the meat. Soak the meat in several changes of fresh cold water over a period of 24 hours to remove the excess salt. My last blog featured Reuben Seup, the lovechild of a Reuben sandwich and French onion soup. Crucial to its success is good pastrami. Sure, you can buy it in a store if you want to settle for a nasty slab full of chemicals and preservatives, but nothing beats making it yourself. Pastrami starts as corned beef, which starts as beef brisket. It takes about 3 weeks to make corned beef, and a little more time after that to reach pastrami nirvana. But it’s not difficult to do. Brining is a time-honored way of preserving and it prevents bacteria from growing. Both pastrami and corned beef are made this way. Both corned beef and pastrami start with a brisket of beef. Corned beef is then cooked–usually boiled–and served. Pastrami is made when the brined meat is rubbed with more spices and smoked to add extra flavor. So corned beef and pastrami are the same meat, just treated differently. In the 1/4 cup of warm water, combine the sugar, minced cloves, paprika and pickling spices. Combine the coriander seeds, black and white peppercorns and mustard seeds in a spice grinder and grind coarsely. Place them in a bowl. Add the salt, paprika, brown sugar and granulated garlic. Mix well. Heat the smoker to 225 degrees and smoke for several hours using a less intense wood, like oak. When the internal temperature of the meat has reached 165 degrees, it’s done. It isn’t necessary to smoke pastrami as long as you would a regular brisket because the long brining time makes the meat tender. It’s very important that absolutely everything that comes in contact with the meat is very clean. (This includes your hands.) Also, make very sure that every inch of the meat reaches the 165 degrees before it is removed from the smoker. The corned beef is now pastrami! Let it rest before slicing. Despite that corned beef is not an authentic Irish dish, it seems that everyone thinks they should eat it on St. Patrick’s Day. The phrase “corned beef” was actually coined by the British, and although the Irish were known for their corned beef throughout Europe in the 17th century, beef was far too expensive for the Irish themselves to eat and all of it was exported to other countries. Owning a cow in Ireland was a sign of wealth, and the Irish used theirs for dairy products, not beef. The Irish ate pork, and a lot of it, because it was cheap to raise pigs, and they traditionally prepared something like Canadian bacon to celebrate St. Patrick’s Day in Ireland. It takes about 3 weeks to make corned beef, so you can’t make it in a day. But now that you know it’s not Irish anyway, that’s OK! Doing it yourself is not difficult, and you get a better quality product than that nasty slab from the supermarket that’s full of chemicals and preservatives. Brining is a time-honored way of preserving and it prevents bacteria from growing. Both pastrami and corned beef are made by this method. Both corned beef and pastrami usually start with a brisket of beef. Corned beef is then cooked–usually boiled–and served. Pastrami is made when the brined meat is rubbed with more spices and smoked to add extra flavor. So corned beef and pastrami are the same meat, just treated differently. Combine the coriander seeds, black and white peppercorns and mustard seeds in a spice grinder and grind coarsely. Place in a bowl. Add salt, paprika, brown sugar and granulated garlic. Mix well. It takes about 3 weeks to make corned beef, so you won’t have it ready for this St. Patrick’s Day. But now that you know it’s not Irish anyway, that’s OK! Doing it yourself is not difficult, and you get a better quality product than that nasty slab from the supermarket that’s full of chemicals and preservatives. Combine coriander seeds, black and white peppercorns and mustard seeds in a spice grinder and grind coarsely. Place in a bowl. Add salt, paprika, brown sugar and granulated garlic. Mix well. Heat smoker to 225 degrees and smoke for several hours using a less intense wood, like oak. When the internal temperature of the meat has reached 165 degrees, it’s done. It isn’t necessary to smoke pastrami as long as you would a regular brisket because the long brining time makes the meat tender. St. Patrick’s Day is about 3 weeks away…just in time to make your own corned beef! It takes about 3 weeks to make corned beef, but it’s not difficult to do. Doing it yourself gives you a better quality product than that nasty slab from the supermarket that is full of chemicals and preservatives.